Illinois State University Horticulturist Patrick Murphy. Never plant a willow unless you want the roots to tangle with your water line. Pear trees are proven disappointers. Yellow birch bark gives off a wintergreen scent. 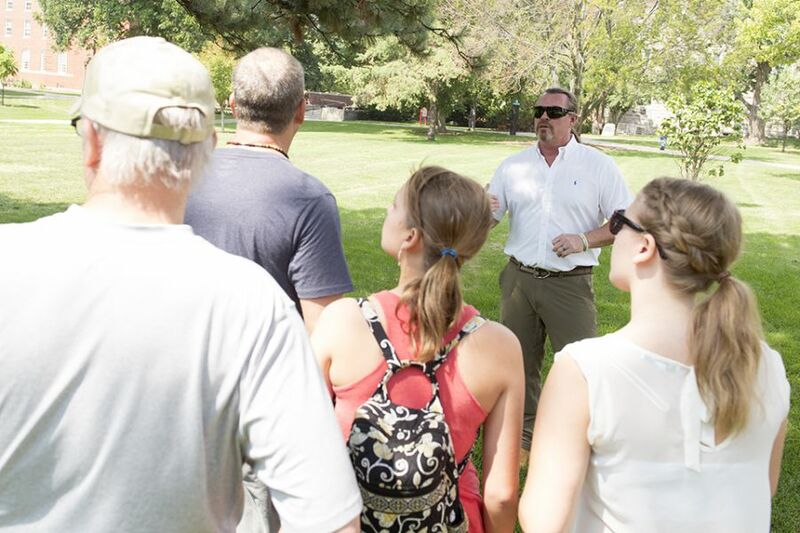 These are just a few of the facts Horticulturist Patrick Murphy rolls off during a recent Wellness Tree Walk, an effort he started this summer after being approached by Ramona Swanberg of Human Resources. When she asked about the possibility of a noon-hour walk, similar to the popular tree walks offered by newly retired Dean of Green Don Schmidt, Murphy was not only happy to do it, he offered to tailor it to her department’s location on West Campus. But she found out differently as Murphy led staff toward a row of gingko trees and a black walnut grove near the Eyestone School Museum. The wellness component comes from trying to keep up with him. “I can walk faster than some people can run,” he said, hustling toward a creek embankment. Murphy on one of his recent tree walks on campus. Murphy scheduled three walks, with the thought that each would pick up the pace, but it turned out the group was more interested in pausing by trees and asking questions than getting their cardio in. Murphy is curator of the Fell Arboretum, which includes 490 acres, thousands of trees, and more than 154 species across campus. The former landscape designer and utility forester said his priority is clear: generate awareness of and use of the Fell Arboretum. “I’m picking up where Don (Schmidt) left off, archiving and increasing our credentials as an arboretum,” he said. Plans are to offer year-round tree walks for the community too, giving them ideas on what trees and shrubs might work in their own yards. Murphy gives weekly gardening advice as host of a new show, GLT’s Grow, with co-host Laura Kennedy that airs at 8:50 a.m. and 4:50 p.m. Fridays. Illinois State Horticulturist Patrick Murphy on one of his recent tree walks on campus. “Grow is geared toward increasing awareness of and usage of the Arboretum,” he said. The horticulturist’s dream is to create a digital archive of the Fell Arboretum with an application that would allow a phone or other device to become a tour guide. 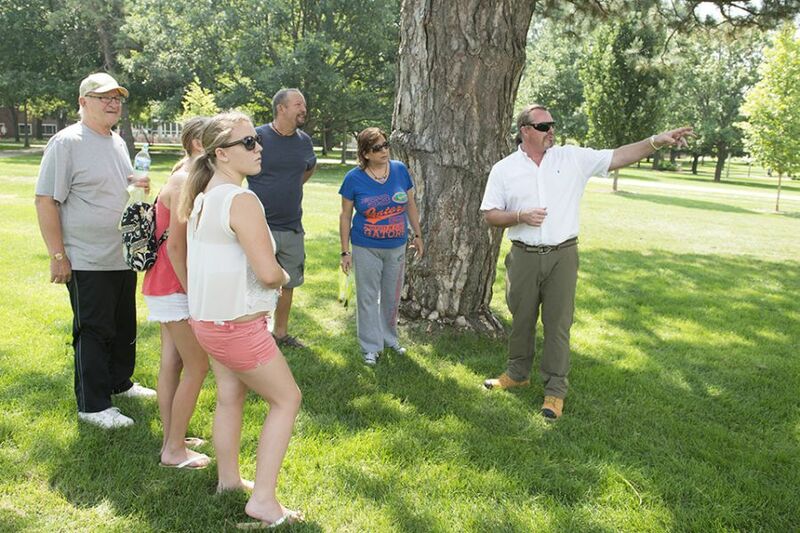 On September 13, he’ll do a tree walk for parents during Family Weekend, weaving them around the Quad and pointing out the oldest tree in Normal, a 180-year-old Austrian pine just south of the bell. It’s also important to him that students appreciate the landscape, teaching them trees can offer more than shade. To schedule a walk, contact Murphy at (309) 438-3800 or rmurphy@IllinoisState.edu. Kate Arthur can be reached at kaarthu@IllinoisState.edu.